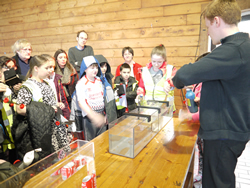 Earlier this year a team of five scientists, including British Oceanographic Data Centre (BODC) data scientist Matt Donnelly and oceanographers from the University of Liverpool, worked together to provide ocean sciences sessions to primary school children as part of a local Science, Technology, Engineering and Maths (STEM) festival. The sessions proved a success with the children who quickly grasped new concepts whilst getting hands on with the equipment. They asked a wide range of questions on the science, what we do with the information collected and working at sea. It was a great opportunity to bring the fascinating world of oceanography 'into the classroom', and discuss the detailed work undertaken by BODC and researchers alike.